Monarch HDX™ dual-channel H.264 encoding appliance for broadcast streaming and recording. The Matrox Monarch HDX is a simple and versatile video encoding appliance specifically designed for broadcasters and webcasters who need a flexible solution that is powerful enough to take on today’s demanding video delivery workflows. Monarch HDX offers 3G-SDI and HDMI inputs with frame-synchronization to correct any discontinuity at the input, and two independent H.264 encoders that can be assigned to individual tasks. By providing two encoders in a single device, Monarch HDX can tackle any job; from streaming to two different locations, to recording a proxy quality file while simultaneously recording master quality version for post-event editing, to using one encoder for streaming while the other records at higher quality for VOD downloads. Whether used as a live streaming encoder or video recorder, the Monarch HDX can integrate seamlessly into virtually any SD and HD installation. The Monarch HDX can share 30 Mb/s of encoding capacity across the two channels. Each channel benefits from a powerful scaling, de-interlacing, and noise reduction engine to ensure only pristine images are sent to be encoded. When used as a webcasting encoder, the Monarch HDX generates an H.264-encoded stream compliant with RTSP or RTMP protocols. You can assign each channel separately to deliver what you need, where you need. Each channel can stream up to 10Mb/s, allowing you to simultaneously stream to two destinations or set the device for up to 20Mb/s streaming quality for a single encoding destination. Monarch HDX provides a huge amount of flexibility as an H.264 video recorder. Content can be captured in either MOV or MP4 files to ensure that they can be played by your application of choice. Recordings can be stored locally on an SD card, a USB drive, or remotely on a network-mapped drive. Dual channel recording allows the user to simultaneously record content locally and to a drive, which means files are immediately available to anybody on the network, but also provides the assurance that no action is lost even if the network goes down. Furthermore, each recording can be done at a different bitrate should there be a need to deliver the content to devices with varying decode capacities. The quality of your VOD downloads need never be dictated by the available upload bandwidth. Monarch HDX dual encoders can broadcast a live webstream at one bitrate while simultaneously recording mastering quality H.264 files for immediate availability, such as post event VOD or editing with your NLE of choice. Monarch HDX H.264 video recorder can accept signals from HDMI or SDI sources. The input is selected using the web based UI, Matrox Command Center, or directly on the unit itself, allowing for a wide range of connectivity to devices such as cameras, switchers or routers. Additionally, both inputs are complemented by internal frame synchronizers to ensure uninterrupted streaming and recording operations, regardless of the disturbance on the input. The audio is also selectable between the two channels of the embedded video signal or the analog stereo input. Audio may be dynamically muted/unmuted without affecting the video encoding operation. Regardless of input selection, SDI, HDMI video and embedded and analog audio outputs are live. For SDI workflows, the Monarch HDX recorder has an extremely low pass-through latency with a built-in power-loss relay which, in case of power loss, will route the SDI input directly to the SDI output, ensuring signal path integrity and fail safe design options. Whether you’re providing live streaming content to Adobe Flash or Wowza Media servers, to any of the popular CDNs, or directly to a computer, Matrox Monarch HDX’s flexible video streaming protocol support is up to the task. The Monarch HDX is a certified “Works with Wowza” live video streaming encoder, allowing our users to benefit from enhanced integration with the Wowza streaming engine. As a certified encoder, Wowza Manager can provide an XML file which contains the credentials required for Monarch HDX to easily connect to the Wowza Streaming engine. The Monarch HDX also supports XML files generated for use with Flash Live Media Encoder. These files are often offered by CDNs to allow their customers to easily connect to their service. Both XML files are loaded into the Monarch HDX using the Matrox Command Center, a web based UI. 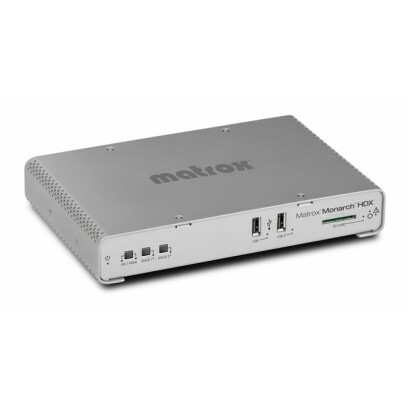 Matrox Monarch HDX can be controlled and configured via the Monarch HDX Command Center using any device on the network that supports a standard web browsing application such as a computer, smart phone or tablet. Designed for operator ease-of-use, master controls provide one-click operation to start streaming, recording or both from anywhere within the user interface. The device also provides convenient controls directly on the unit itself to stop/start recording or streaming, and an additional button to assign the input. Monarch HDX H.264 encoder provides a very useful low bitrate preview stream of the input directly in the Command Center UI. This same preview can be viewed using software players such as VLC or on third-party devices, such as Crestron control panels. This stream is available independently of the two encoder channels allowing you to check your video signal before your webcast goes live. Monarch HDX ships with a number of typical streaming and recording presets that define all the encoding parameters including resolution and bitrate. Whether preset or custom parameters are used, they only need to be entered once and saved as a unique profile. A profile not only contains encoding parameters but also destination information detailing where the encoded video is being sent. Multiple profiles can be saved if the device is used in different environments. Each profile can be loaded instantly without having to re-enter data. Powerful and robust, Monarch HDX offers simple, one touch stream and record push buttons, input selection, and a locking power connector. Monarch HDX's HDMI or SDI outputs makes it easy to monitor what you are streaming and recording, regardless of signal source. All eight channels of embedded audio can be passed from any input to any output. When embedded audio is selected, all eighth channels are passed from input to output. When Analog audio is selected, it is both looped out as well as embedded in video outputs. Its design allows Monarch HDX to be just as easily located on a desktop as in a rack—up to two units can fit in a single 1RU tray. The storage and button controls are conveniently located on the front of the unit while the power and I/O ports are found at the back. Finally, the Monarch HDX also features a wide input voltage range of 9 to 24 volts. It can be powered using the Matrox supplied power supply or DC sources such as standard field batteries.